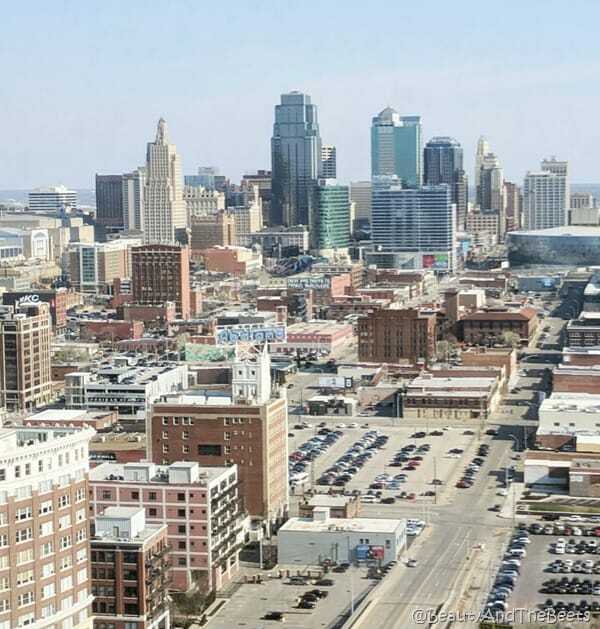 I was recently in Kansas City, Missouri for the first time to attend a blogging conference. While the information I gathered from the event was great, I played hooky the last day to join a 3-hour Taste of Kansas City Food Tour. 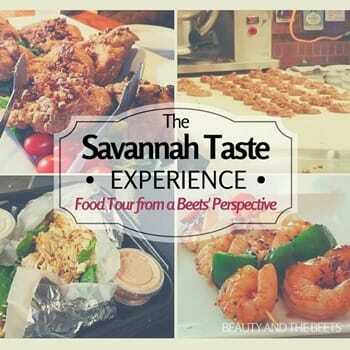 I personally think food tours are one of the best ways to really get your hands dirty with the ins and outs of a city. Especially when your hands are dirty with BBQ chicken and sausage lamb rolls. 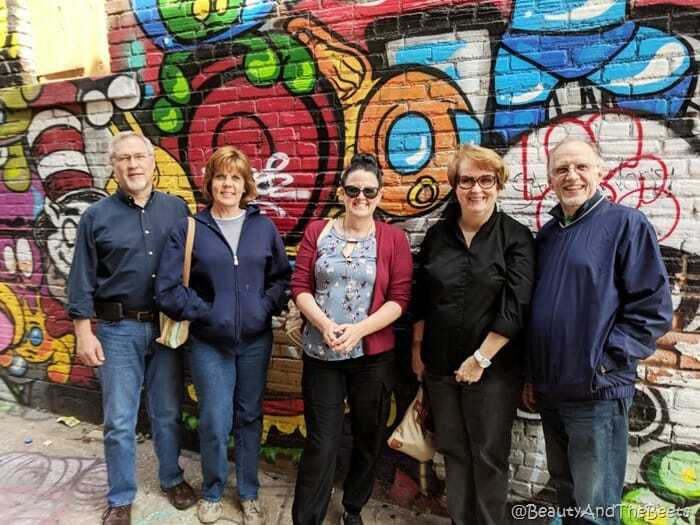 The Kansas City Food Tour meets at Red Dragon House in the Historic Garment District. 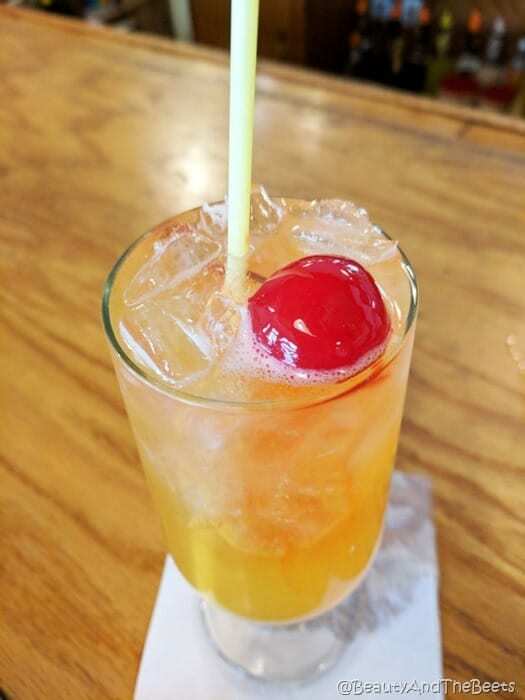 If you arrive early enough you can relax and enjoy a tokkuri of Sake, or a refreshing Mai Tai. Once our tour guide showed up, we all gathered around a table in the restaurant and were immediately served Crab Rangoons, Egg Rolls, Kung Pao Chicken and Sesame Chicken. And I will warn you as I warned from the very beginning, pace your food intake because the servings are not tiny. I found it incredibly difficult to restrain myself at every place we visited simply because I knew I had to save room for all the stops. 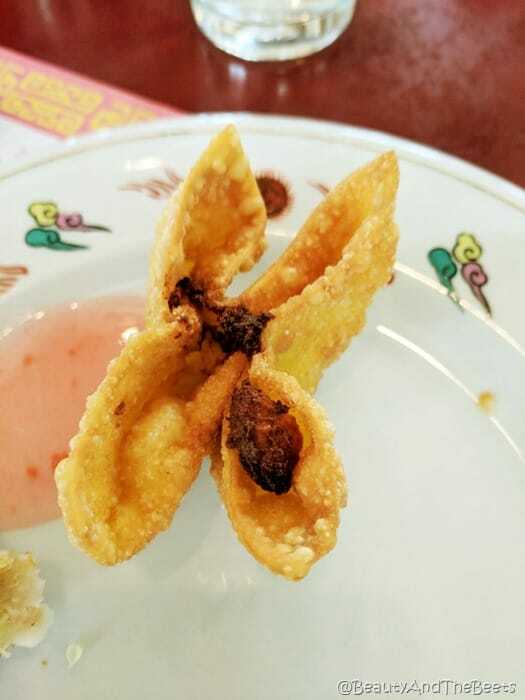 My favorite at Red Dragon House was the crab rangoon. As we enjoyed the food at each stop, we learned about the history of the city, from the reign and influence of mob boss Tom Pendergast to the abundance of brothels for those passing through the city on their way to find gold in California, to the sequence of an entire system of underground tunnels used to smuggle alcohol during the days of Prohibition. 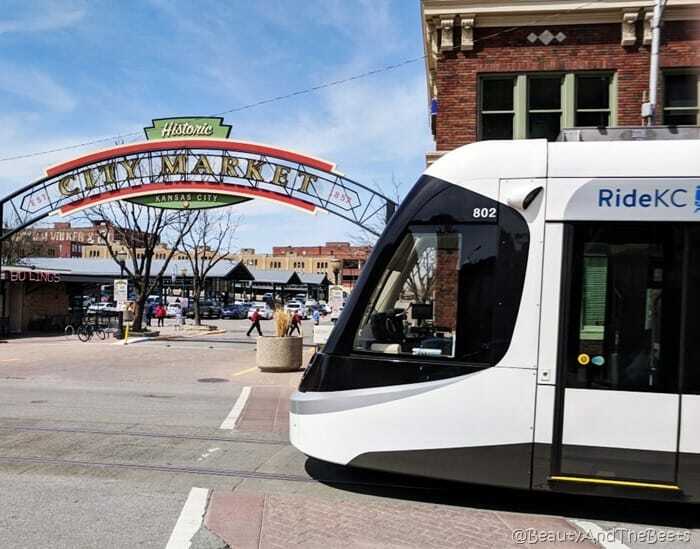 There are a few varieties of the Kansas City Food Tour offered- the daytime tours include transportation on the free streetcar that runs through the city, or you can opt for the tour I did called the Lip Smacking Foodie Tour, which was offered by bus. A mini bus. With only five of us on my tour, we had plenty of room to spread out in the bus/van. The second stop was to an Australian bakery called Banksia Bakehouse. 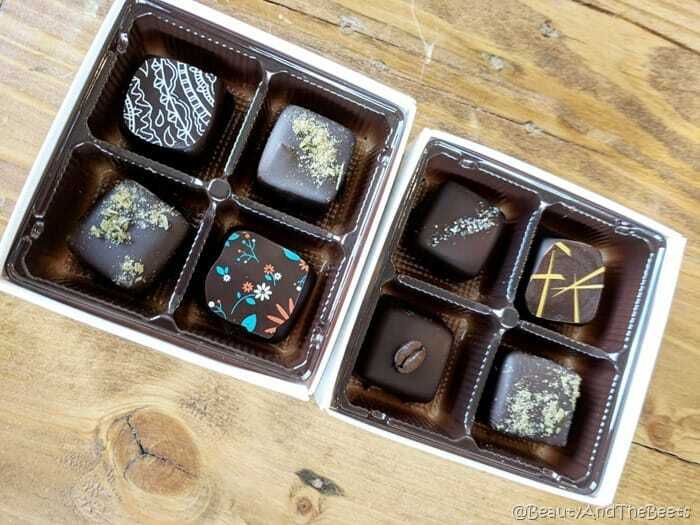 Banksia (named after a fruit tree in the land down under) was started by three friends from Australia who wanted to infuse their native cuisine with the food of Kansas City. 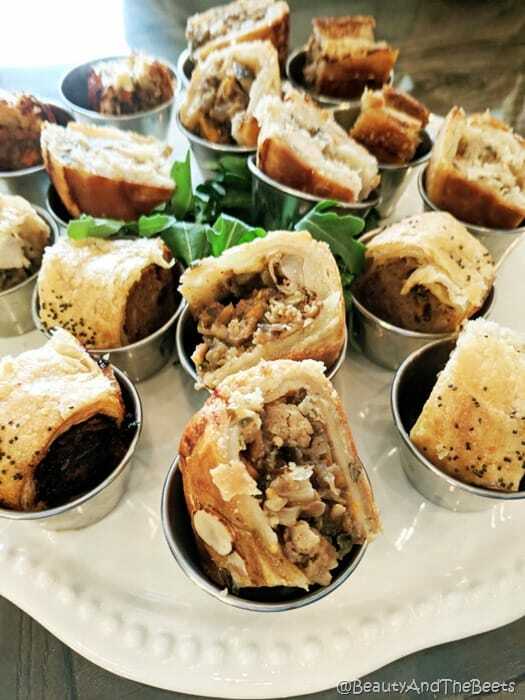 We indulged in a plate of pie and sausage rolls, from Smoked Veggies to Pork and Fennel to Australian Lamb, each roll was better than the last. 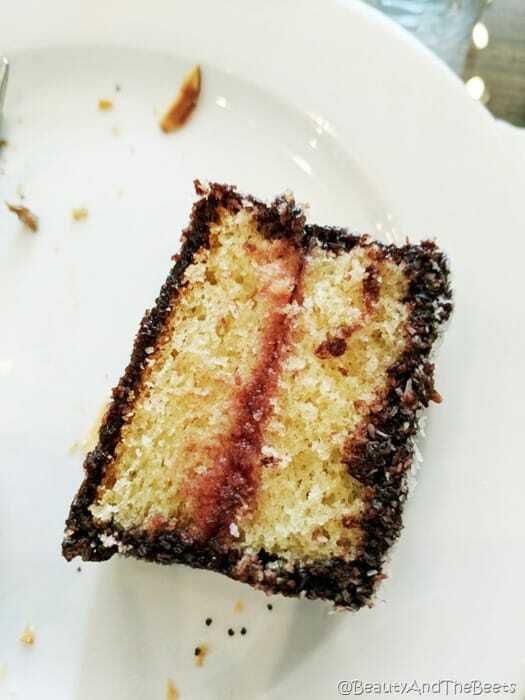 We were also given slices of Lamington, an Australian sponge cake dipped in chocolate syrup, layered in raspberry jam, and coated with coconut. 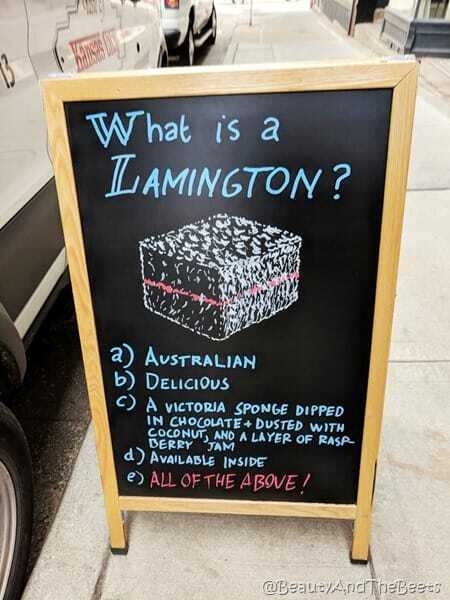 Super moist and creamy, Lamington is not for the sweet faint of heart. 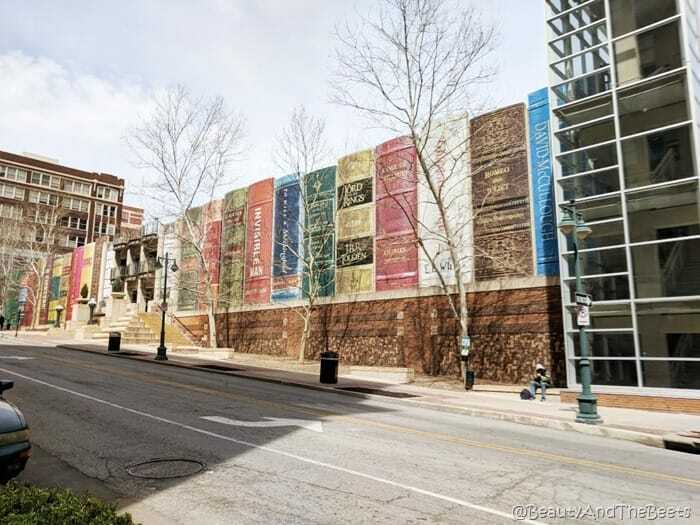 Next we took a quick drive past the Kansas City Public Library, painted to look like books on a shelf. The books that are featured on the building were voted on by residents of the city and include classics like Charlotte’s Web and To Kill a Mockingbird. We made our way up to the River Market District to the City Market, a collection of shops, restaurants and Farmer stalls just south of the Missouri River. The group had an opportunity to visit the Planters Seed and Spice Company, an indoor market with an array of food products, spices, teas, coffees, soup mixes, candies, nuts, trail mixes, dried fruits, vinegars and a large variety of garden gifts. 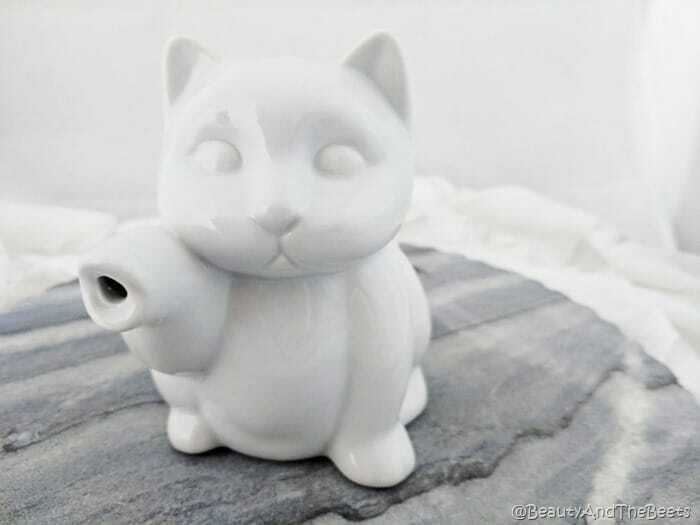 I picked up this adorable kitten creamer for only $10! 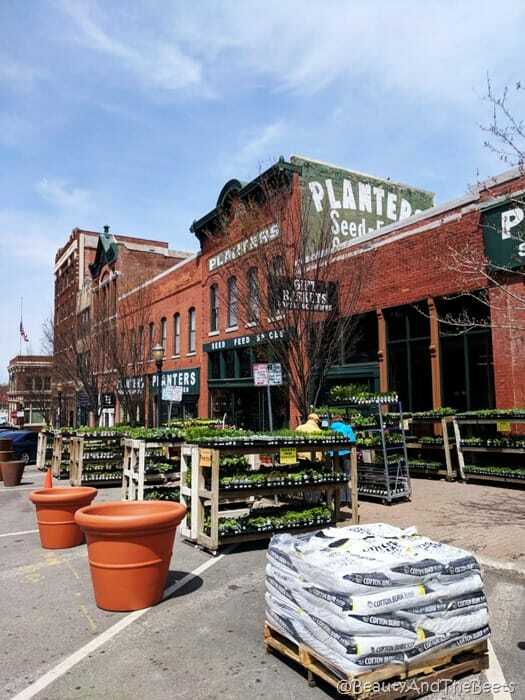 As part of the Kansas City Food Tour, we were also generously gifted with a large bag of Planters Original Barbeque Spice and Sugar Rub to take home with us. Next up we ventured into the Crossroads neighborhood of the city, an area known for its many art galleries and colorful decor. 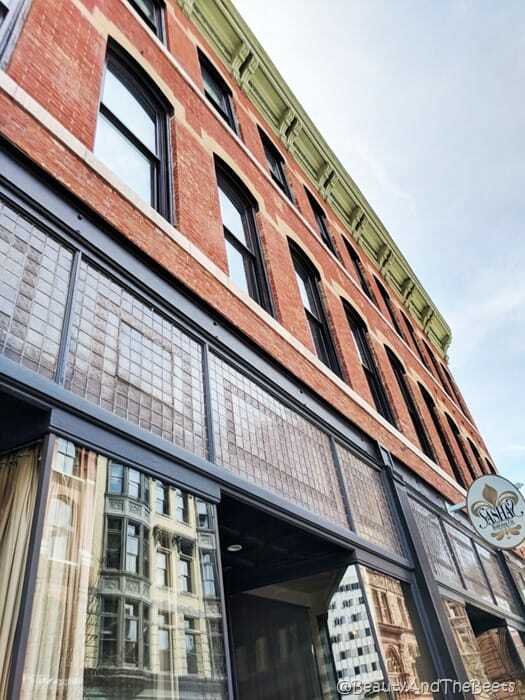 While many of the storefronts seem to be empty, this district hosts almost 10,000 visitors every month during First Fridays where the showrooms open their doors, food trucks line the streets and Kansas Citians gather in droves to celebrate art and drink. 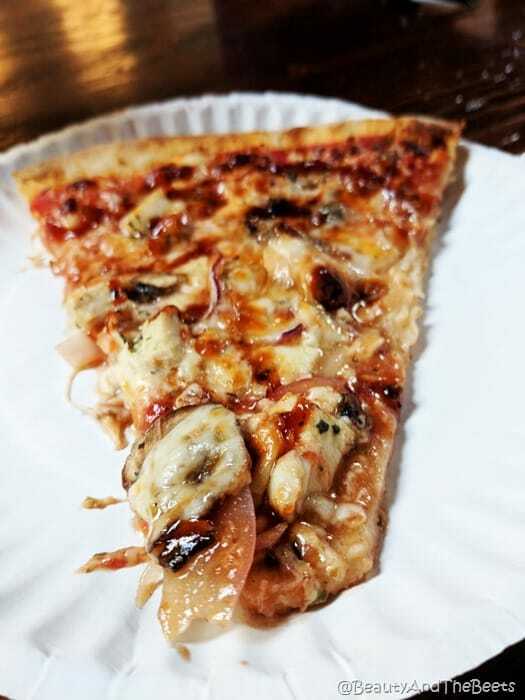 We went into a pizza spot called Papa Keno’s Pizzeria and we all split a giant BBQ Chicken pie. 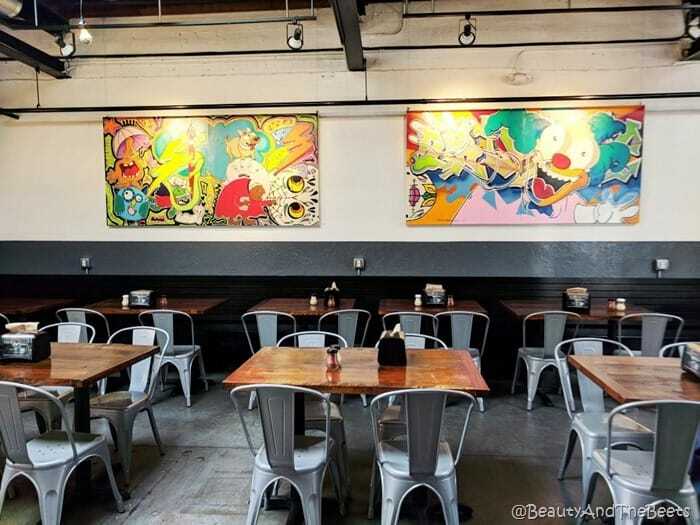 The decor was also nicely tied into the First Friday event with original artwork lining the walls. 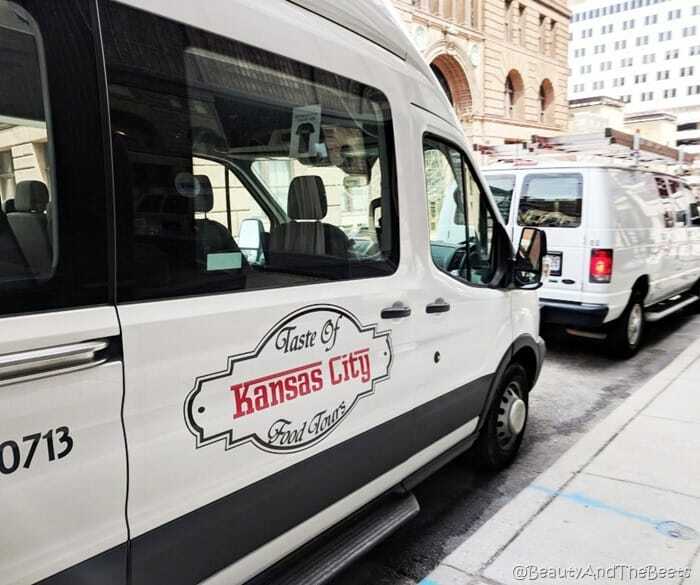 This is also the most convenient location on the tour to grab a draft of a local brew, another “food” Kansas City is known for. It is important to note that the tour does not stop at any of the renowned BBQ spots, BBQ being the other major “food group” the city is super famous for. The reason was explained by our tour guide that there are simply so many opinions as to who serves the best barbeque that not one spot can be pinpointed down on the tour. I felt like I had already had enough BBQ during my stay that I was actually grateful to be trying new foods. Our second to last stop is actually not a normal place our particular tour visits, but if there is time you can request a stop here. 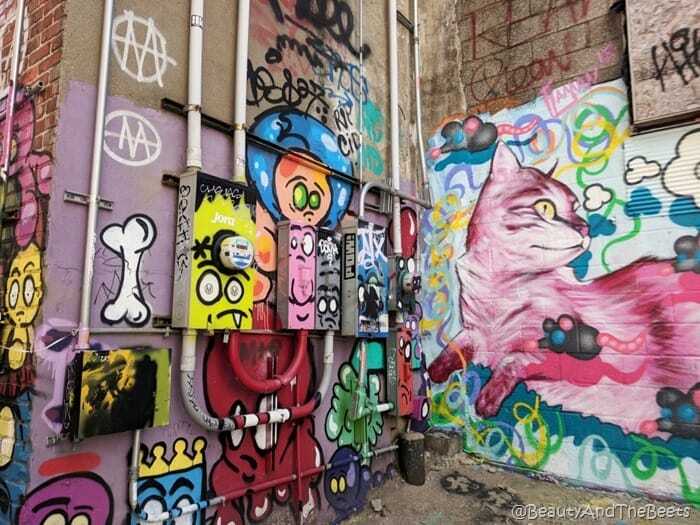 Artist Alley, a literal street art museum. 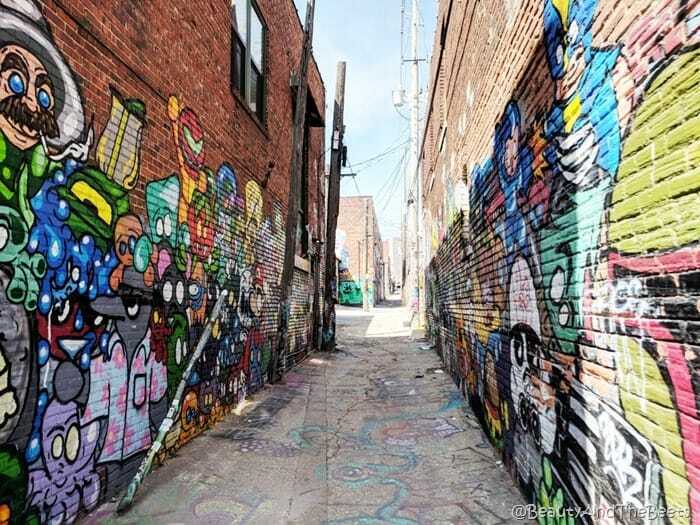 For those of you familiar with the city, you can find the alley located between 17th and 18th Streets near Locust and Cherry Streets. 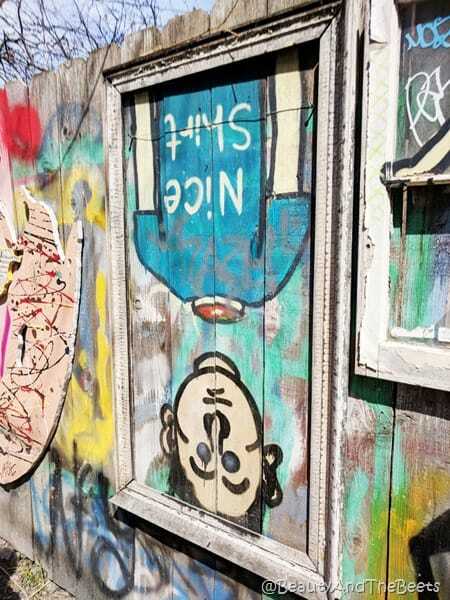 It was started in 2014 with a local freelance artist named Jason Harrington who received permission to paint part of the exterior wall of the Slap-n-Tickle Gallery. 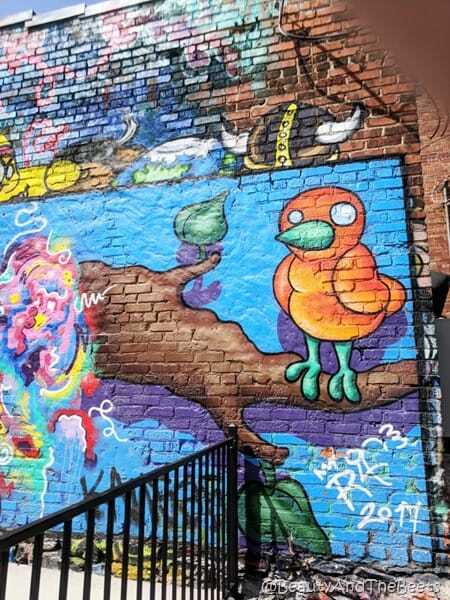 Since that time, other building owners in both the alley and the neighborhood have given permission to local artists to paint their art on the wall lending to perhaps the most colorful alley in the United States. As our time was winding down, the last stop of the tour was at a local candy/confection shop called Bizz & Wizzy Confections, across from the old TWA Airlines Headquarters building. 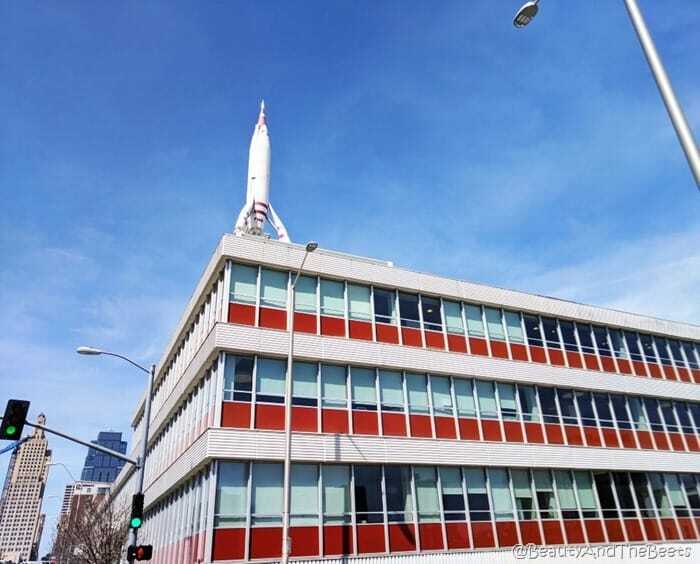 Though TWA has long moved out of the space, it is interesting to see the 22-ft skyliner rocket still atop the building. The rocket was designed by Kansas City home grown hero – Walt Disney. It was modeled after the spaceship that sits in California’s Tommorowland in Disneyland. Anyway, back to the sweets. 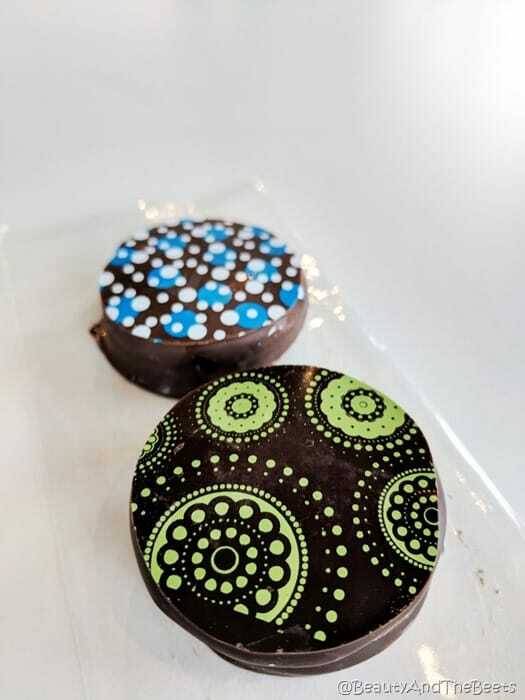 We enjoyed chocolate dipped Oreo cookies while learning the history of the shop. I ended up grabbing a box of caramel candies to take back to Florida with me – my favorite flavor being the BBQ Caramel. How can one come to Kansas City and not take home a box of barbeque caramels? I could be home and relive my Kansas City Food Tour with my family. So now that I have told you everything you will eat, see, and learn about on the tour, are you ready to enjoy it for yourself? 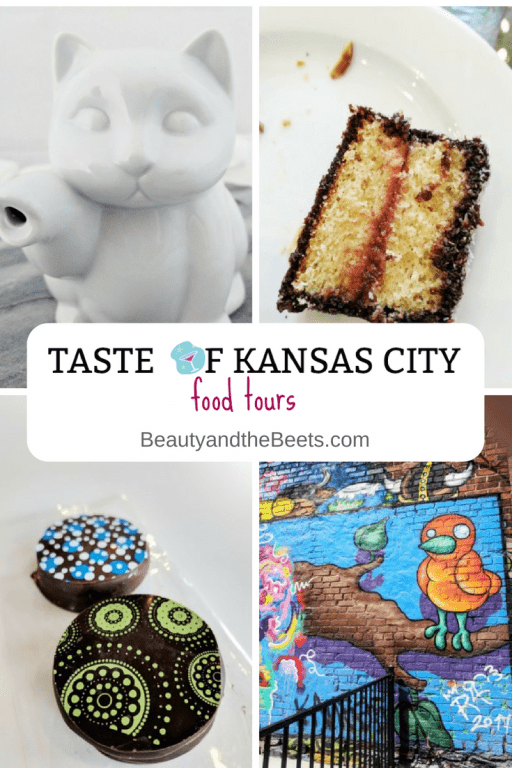 Visit Taste of Kansas City Food Tours for more information on this tour or to learn about any of their other events. I wish to add that I was not compensated on this tour for a post. I was not sure if I was going to be able to sneak away from the conference so I wasn’t able to commit until the day before. I just want to clarify that I was not paid or asked to say nice things about them!! I haven’t used it yet as I am afraid I will be clumsy and break it!! It was so delicious and nice to see a different taste of the city! That was so well done and the pictures are great. You definitely made me want to visit Kansas City. 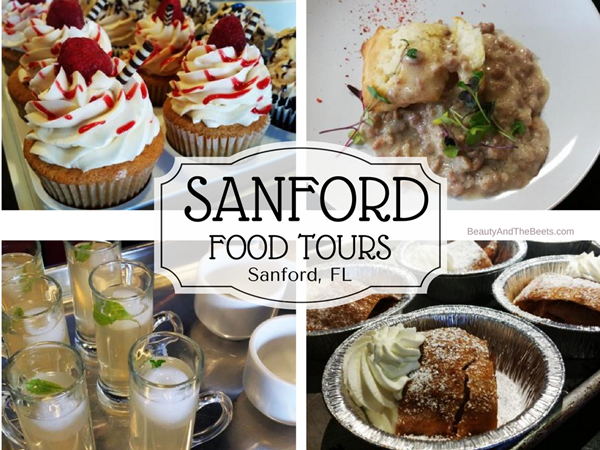 Of course, it would be great to do the food tour as well. Fantastic job!!!!!!!!!! Kansas City really surprised me as I wasn’t sure how interesting the city was. But it was a wonderful place!